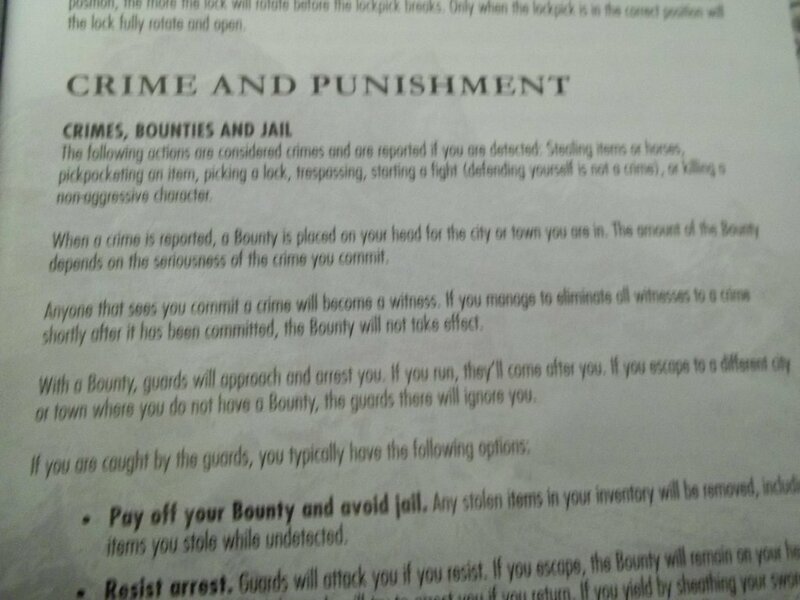 Leaked Skyrim Manual Reveals "Hirelings"
The Elder Scrolls: Now with more sword slaves, bullying and cooking pots! Poor Skyrim can't seem to go a week without something leaking. Recently, we've gotten an early look at both the achievement list and world map. 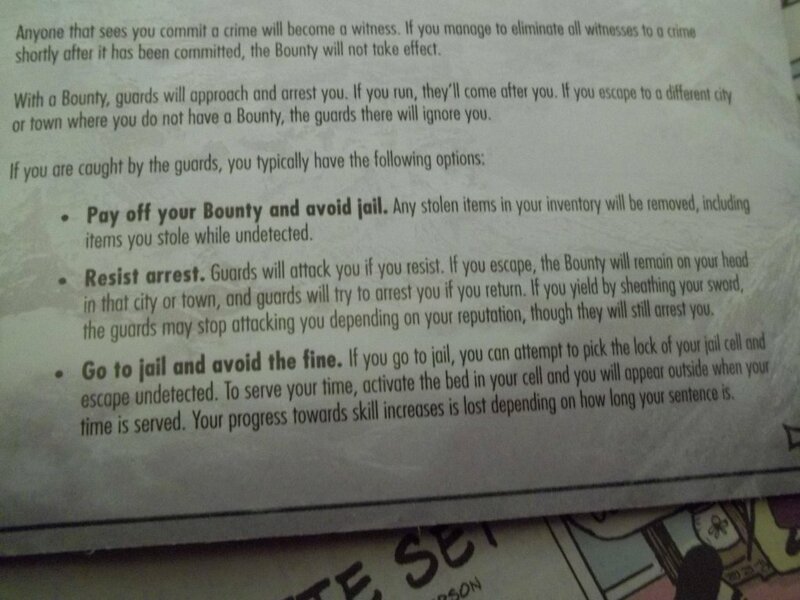 Now, someone has photographed what appears to be the final retail manual for the Xbox 360 version of the game. Many of the pages show nothing that's going to surprise you--control schemes, leveling information, epilepsy warnings, etc.--but some sections do outline some nifty new mechanics. Don't worry, no plot or story spoilers ahead. 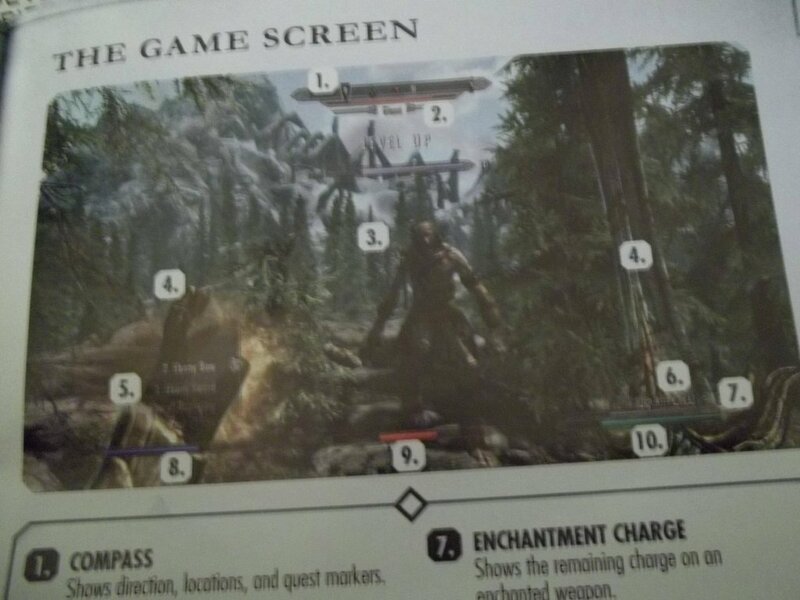 According to the book, Skyrim will employ a companion system, allowing players to hire NPCs called "hirelings" from local taverns to accompany them into the fray. Hirelings will be unique, each specializing in one or more of the various skills of the land to help you on your quest. Once hired, you'll be able to issue orders to your new minion, including asking them to wait, attack an enemy, perform an action, open things, and pick up items. 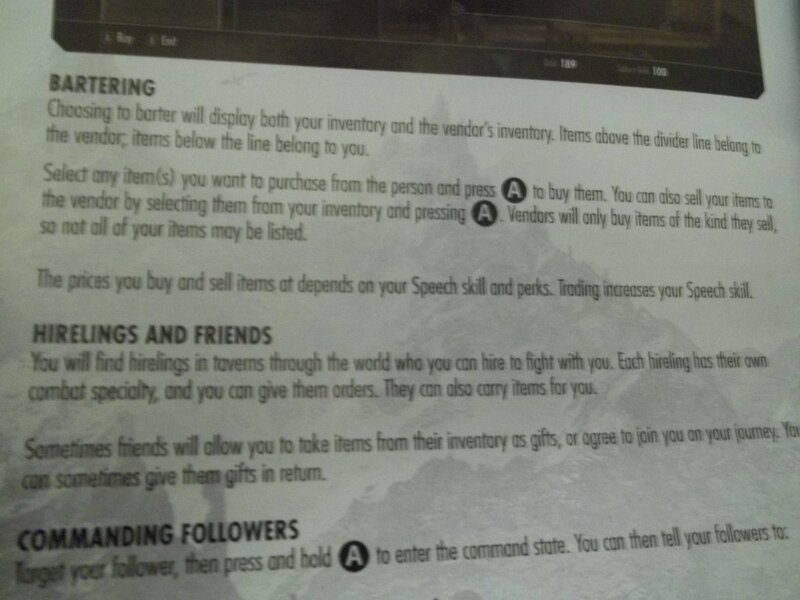 Because hirelings have the ability to take items from containers (defined in the manual as anything from chests to dead bodies), it seems possible that they'll also be able to help you with inventory management, which, in games like this, can quickly become a major concern for even the least materialistic of players. And yes, even the manual confirms it, the Elder Scrolls' dreaded "encumbrance" is back in full effect for those of you who just can't leave that second Daedric Claymore behind. Any foodies out there will be pleased to see that the book has also outlined a new ability to cook (BAM!) using special "cooking pots" found in various shops around town. According to the manual, "Cooking pots allow you to prepare food items that provide various temporary effects. 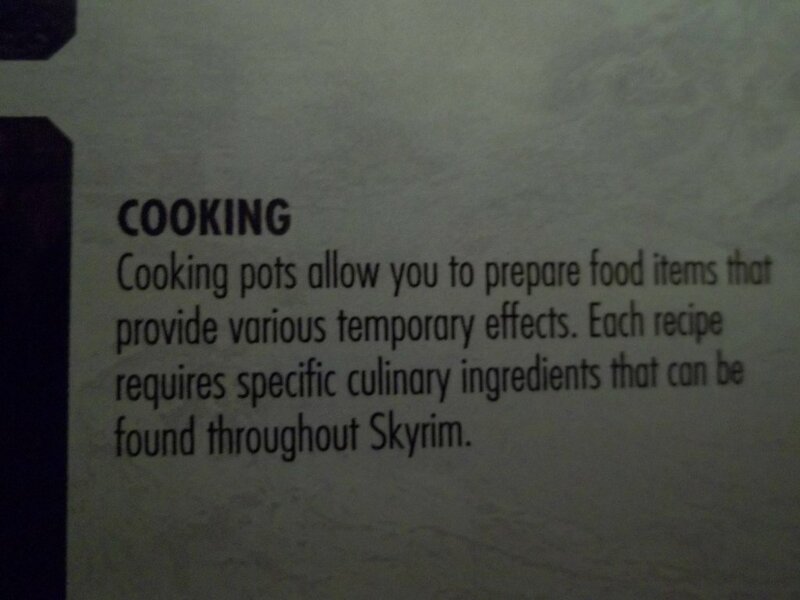 Each recipe requires specific culinary ingredients that can be found throughout Skyrim." Cooking is the latest of many confirmed skills available in the game, including farming, mining, woodcutting, and blacksmithing. 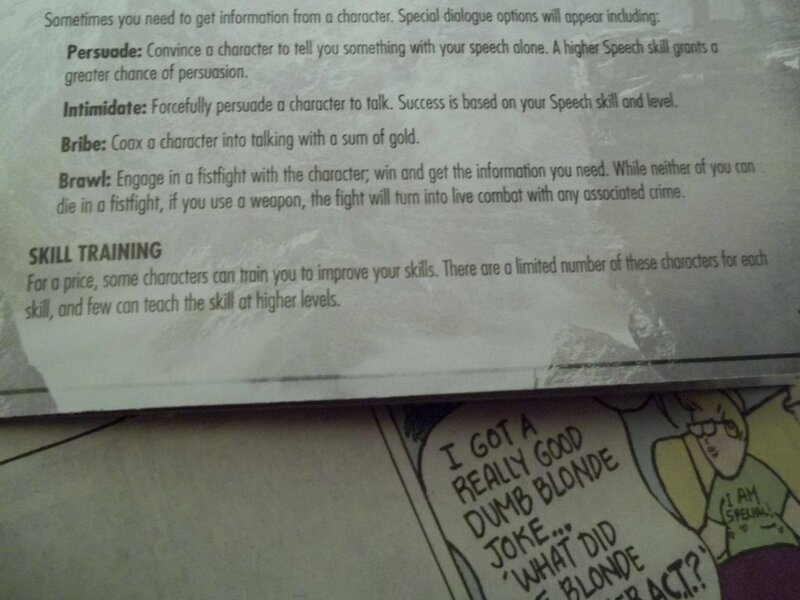 A new dialog option, "brawling," has also been revealed alongside persuasion, intimidation, and bribery. Not much is said beyond the name, but I think its safe to assume that if the old palm grease technique falls flat, you'll be able to punch that uppity khajiit merchant in the snout. If someone sees you lay that cat out, or perform any other crime, they'll be able to report you to the town guards a la Oblivion (unless you kill all of the witnesses first), at which point a bounty will be placed on your head commensurate with the extent of your misdeed. Once the fuzz is onto you, you'll need to pay the fine, fight until you drop, or do your time, losing skill progress in the process. 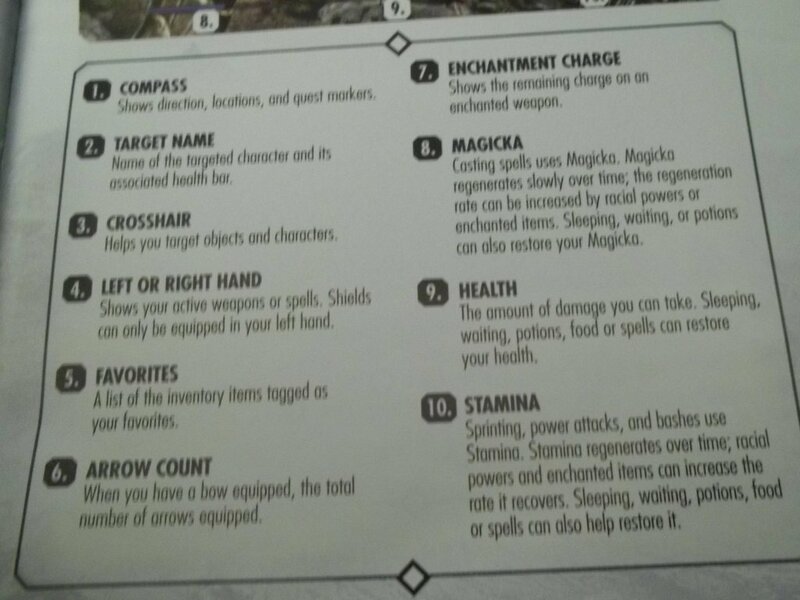 The manual covers some more ground, such as the way Dragon Shouts will work and how to shoot a bow, but mostly things we've already been told or have seen in the official walkthrough videos. 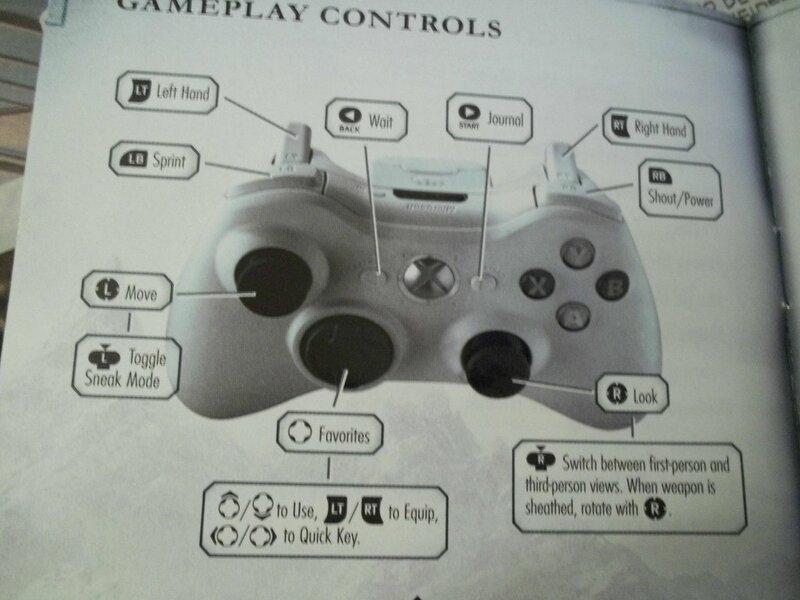 If you simply must know which button on the controller will allow you to swing your shortsword, however, you can check out the rest of the manual here and get started on your finger exercises early.